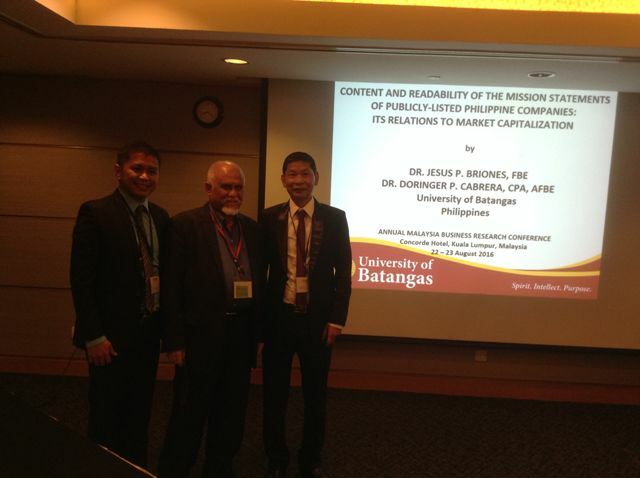 Dr. Jesus P. Briones, the current director of the University of Batangas Publications Research, Linkages and Liaison (PReLL) and Dr. Doringer P. Cabrera led the group of researchers and scholars from 18 countries in the Annual Malaysia Business Research Conference held on August 22-23, 2016 at Kuala Lumpur, Malaysia. The two-day conference was divided into six sessions with Dr. Briones being the chairperson (lead facilitator) of the fourth session and Dr. Cabrera as chairperson for the fifth session. The tandem, the only Philippine delegates, also presented their paper on the Content and Readability of the Mission Statements of Publicly-Listed Philippine Companies: Its Relations to Market Capitalization. This year’s conference is aptly themed “Research for Progress”. As a result of the rigid screening process, only twenty-seven papers under the categories of Management, Marketing, Economics, Finance and Accounting tracks were accepted and presented during the two-day conference. The presenters came from Australia, Austria, Bahrain, Colombia, India, Indonesia, Iran, Korea, Malaysia, Mauritius, Nepal, Nigeria, Pakistan, Philippines, South Africa, Sri-Lanka, Taiwan, ROC and Thailand. The Annual Malaysia Business Research Conference is organized by Global Research Institute for Business Academics under the helm of Prof. Mohammad Hoque, Ph.D. and the auspices of the London Academic Research and Publications Limited.